Well, the time has come for my first electric conversion project! I really wanted to convert a Toyota Paseo I picked up a while ago, but it would have cost too much for me at the moment. So, my next thought was that I really could use a riding mower. I have push mowed my lawn. Its not small and it takes a long time. So, I talked things over with Ben Nelson and MetroMPG, the two EV guys I know and decided to go with an electric riding mower. No more gas burning lawn mowing for me! This weekend I picked up a Simplicity 728 (I have no idea what year) from a very kind gentleman. I found and got the mower for free using FreeCycle.org. It currently has a mildly used 8hp Briggs engine in it. The deal with the donator was that I take the engine out and return it to him since it hasn’t seen much use. I was all too happy to oblige! So, now I have a new project for this winter. Hopefully updates will come fast, so check out the EcoRider’s forum threads for the latest on the project. what type of electric motor does it take to run your lawn mower. 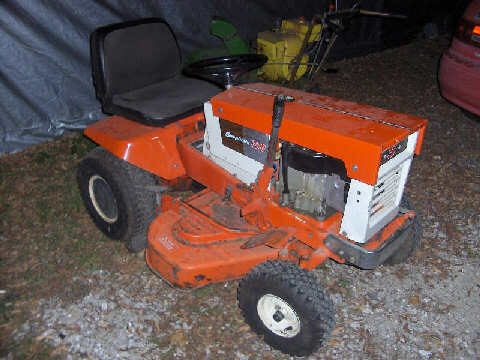 I was looking into turning one of my commercial mower into electric.is it hard to do. The motor I used is a series wound DC type motor. Guys have also used permanent magnet DC motors to do conversions as well. I don’t know if I would suggest using an electric mower for a mowing business. The main weakness they have is that the run times aren’t as long as a gas/diesel mower. When the battery pack is drained, you can’t just fill it up in a couple minutes like you can with gas. So, if you are mowing large areas, you might not be able to mow it all in one sweep. Back in the 70s, GE put out an electric mower called the elec-trak. According to an owner I’ve talked to, these mowers can mow about 2 acres before needing to be recharged. Barring using more energy dense batteries (nickle metal hydride or lithium ion), I would think that that is about the limit that you could expect from a lead acid mower. As far as the conversion being hard to do, its really not. On my mower, the hardest thing is sizing the batteries for what I want to be able to do and still keep the conversion fairly inexpensive. The physical mounting of all of the components is quite easy. Keep an eye on the blog or check out the build thread I have on the forum for more info.